It wasn't his idea to make this tour their last but as the elder Osmond brothers started out performing before Jimmy was even born, there was little he could do about it. "This is the legacy that my brothers have created and this is their wish," says Jimmy, who'll be 48 next month. "I think we could have gotten another ten years out of us – I know the demand is there. So it's kind of bittersweet for me." Not that he'll be sulking his way through their show at the Royal Concert Hall next week. "This last tour is important to us and we want it to be fun. We want it to be a great big thank you to everyone for their love and support through the years." "I've always been welcomed in whatever I do, whether it be singing or doing panto. "Since the 70s, the UK has been amazing, not just to me but to all my brothers." He then adds: "They aren't fans – they are all friends... and we don't deserve them." Joining him in the line-up for this final tour is Jay, Wayne and Merrill. "The brothers haven't really stopped performing in all this time. "They are the longest-running group in history with the same members, and it's all down to the older brothers who made it happen." 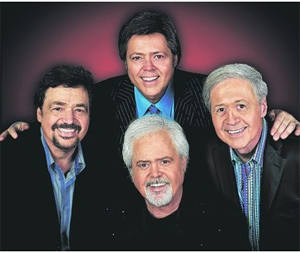 The Osmonds have sold over 100 million records since their first appearance on The Andy Williams Show on US TV 50 years ago, when they sang Be My Little Baby Bumblebee. The biggest hits came in the 70s with the worldwide chart-toppers Let Me In, Crazy Horses and Love Me for a Reason. It wasn't long before members of the family embarked on side projects outside of the group. For a time the charts included hits by The Osmonds, Donny Osmond, Marie Osmond, Donny & Marie Osmond and Little Jimmy Osmond. Jimmy's first real introduction to the world was his solo hit Long Haired Lover From Liverpool in 1972. "It's true that I had never been to Liverpool and didn't know anything about it," he recalls. He adds: "Amazingly, it was the biggest-selling UK hit for anything with the Osmonds' name." Which is why he has to keep singing it. "I learned a long time ago that you don't mess with people's memories. "I left the song out of the set when we were at Wembley Arena once and the place erupted. It was a case of 'just shut up and do your job'." It was 20 years ago, after going behind the scenes and working with the likes of Bon Jovi and Michael Jackson, that Jimmy took charge of The Osmonds' business affairs. "We are really up for this, we love it in the UK," he says. "There's no doubt that it's gonna be a gruelling tour, but we love what we do."